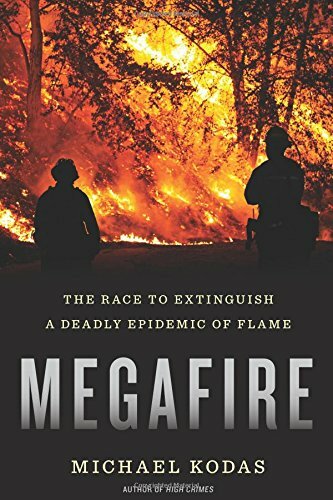 Michael Kodas’ Megafire: The Race to Extinguish a Deadly Epidemic of Flame treads ground with the eye of a solid journalist, revealing territory fraught with danger—danger to the reader, danger to fire fighters, danger to our preconceptions and, not least, danger to the planet. Although always the essence of the book is to impart the very real misconceptions we all have about fires and the environment, it also explores the very real mistakes and out-of-sync planning our misconceptions of fire nurture and feed—exploding, in every sense, across the globe. Kodas treats fire as a being in this book, as a living, breathing, feeding entity that was once benign and welcomed—and now is seen as a mortal enemy. And as with all perceived enemies, the war machine which has been assembled, although often inadequate for the task (after all fire has no boundaries to contain it beyond open water, as he reveals, not even snow covered mountains! ), permits bureaucracy to try and categorize and label fire as if it were something under human control. The author’s solid research leads him to conclude this switch from fire as part of nature to an enemy of the people took place during Teddy Roosevelt’s time—and has exponentially ramped up since—now costing over three billion dollars a year just fighting forest fires in the U.S. Desperate peoples’ escapes, fighting fires in darkest smoke, severe injuries, homelessness, accidents, human tragedies, and the aftermath of destruction are all chronicled expertly and with pathos. There is nothing gratuitous about the author’s reporting; everything serves a purpose, every story another nail in the construction of the exposé. An overabundance of the repetitiveness of the effects of a massive fire on families caused the reviewer to want the book to end, but there is an opposing reality that most people will not read the book in one sitting as the reviewer did. Like watching your favorite murder detective show on TV, stay tuned next week for another horrible tale—and for those types of readers, the book may be a macabre but neverending treat. What was surprising was Kodas’ deft handling of the political, socioeconomic, and commercial need for fires; it is an industry, like it or not. Once declared an enemy, the industrial-political-complexes did what they do best: codify, label, and affix value. Kodas deals with this openly and there is no way a reader will come away without a better understanding of (and anger about) why megafires are allowed to happen. Yes, allowed to happen. At times, reading this, one is struck with the adage, “Careful what you ask for.” The powers that be wanted an enemy and they certainly have one now. The estimate that by 2050 an area the size of Maine will burn every year is evidence that megafire events are growing and fast. How fast? Fifty percent of the Forestry Service budget this year is devoted to forest fires. And as the author points out, they’re losing; men, women, buildings, and often the battle. First-rate research, human interest stories, and intelligent exposés in this book will stay with the reader for years to come. An excellent, if terrifying, must-read if you live anywhere in America (or the world for that matter). Peter Riva is a literary agent and an author of books in two areas, science fiction and African adventure.